The Wooster, OH Micropolitan Statistical Area includes all of Wayne County. As of the 2010 United States Census, there were 114,520 people, 42,638 households, and 30,070 families residing in the county. The population density was 206.4 inhabitants per square mile (79.7 /km2). There were 45,847 housing units at an average density of 82.6 per square mile (31.9 /km2). The racial makeup of the county was 95.7% white, 1.5% black or African American, 0.8% Asian, 0.2% American Indian, 0.5% from other races, and 1.4% from two or more races. Those of Hispanic or Latino origin made up 1.6% of the population. In terms of ancestry, 34.1% were German, 13.3% were American, 12.9% were Irish, and 9.0% were English. 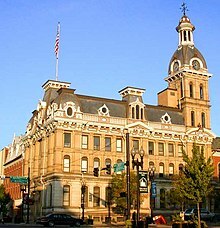 ^ "Wayne County History". Wayne County Public Library. http://wcpl.info/LibraryConnection/Genealogy/WayneCountyHistory.aspx. Retrieved 2012-06-12. ^ a b "State & County QuickFacts". United States Census Bureau. http://quickfacts.census.gov/qfd/states/39/39169.html. Retrieved February 11, 2015. ^ Goodman, Rebecca (2005). This Day in Ohio History. Emmis Books. pp. 119. https://books.google.com/books?id=3IJtVP9WnXEC&lpg=PA304&dq=Morrow%20Ohio&pg=PA119#v=onepage&q=Morrow%20Ohio&f=false. Retrieved 21 November 2013. ^ a b c "DP-1 Profile of General Population and Housing Characteristics: 2010 Demographic Profile Data". United States Census Bureau. http://factfinder.census.gov/bkmk/table/1.0/en/DEC/10_DP/DPDP1/0500000US39169. Retrieved 2015-12-27. ^ "Population, Housing Units, Area, and Density: 2010 - County". United States Census Bureau. http://factfinder.census.gov/bkmk/table/1.0/en/DEC/10_SF1/GCTPH1.CY07/0500000US39169. Retrieved 2015-12-27. ^ "DP02 SELECTED SOCIAL CHARACTERISTICS IN THE UNITED STATES – 2006-2010 American Community Survey 5-Year Estimates". United States Census Bureau. http://factfinder.census.gov/bkmk/table/1.0/en/ACS/10_5YR/DP02/0500000US39169. Retrieved 2015-12-27. ^ "DP03 SELECTED ECONOMIC CHARACTERISTICS – 2006-2010 American Community Survey 5-Year Estimates". United States Census Bureau. http://factfinder.census.gov/bkmk/table/1.0/en/ACS/10_5YR/DP03/0500000US39169. Retrieved 2015-12-27. ^ "Hours & Contact Information". Wayne County Public Library. https://www.wcpl.info/hours-of-operation/. Retrieved 10 June 2016. ^ "2005 Ohio Public Library Statistics:Public Libraries Ranked by Circulation". State Library of Ohio. http://winslo.state.oh.us/publib/05circ.xls. Retrieved October 3, 2006. This page uses content from the English language Wikipedia. The original content was at Wayne County, Ohio. The list of authors can be seen in the page history. As with this Familypedia wiki, the content of Wikipedia is available under the Creative Commons License.